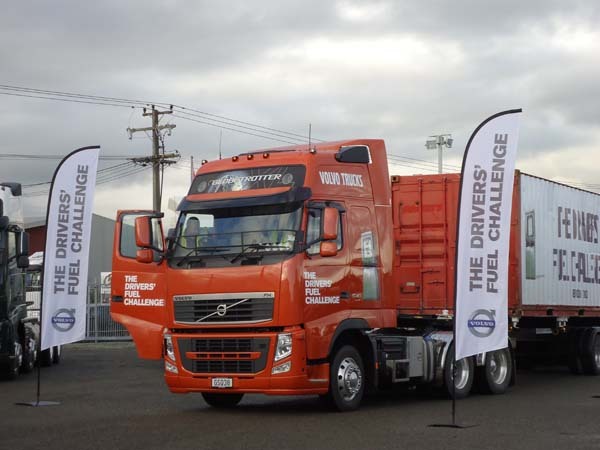 Five drivers will battle it out in the New Zealand final of the Volvo Drivers’ Fuel Challenge on Tuesday. The driver judged to be the most fuel efficient will go on to enter the Asia Pacific Final in August and potentially the world final in Sweden. The five drivers (two winners of the South Island heats, and three from the North Island heats) will take part in the challenge. Their task is to take turns to drive the same fully laden Volvo FH-540Hp truck around a pre-determined course in the most fuel frugal way possible. This is the first time that this worldwide challenge has been held in New Zealand. but takes place annually in more than 50 markets around the world.. The competitors start from Volvo Trucks New Zealand Importer and licensed distributor, Motor Trucks Distributors (MTD) in Malden Street. They will travel a 45 – 50 minute course twice and as they do so, Volvo Truck’s own Dynafleet transport information system will silently record driver behaviour by monitoring brake use, gear selections, speeds, idle times and acceleration. The result will show exactly how much fuel is used down to two decimal places. In one of the heats, just 130ml of fuel separated first and second place, so the drivers’ every action could make the difference in this challenge. And it’s driver behaviour that is at the core of this event according to Volvo’s National Sales Manager, Clive Jones, “We know from worldwide experience that as we reduce fuel consumption, we reduce wear and tear on both truck and driver. This in turn reduces maintenance and repair costs and we find drivers tend to experience less stress, therefore becoming more productive and at less at risk of mistakes, which potentially cause accidents. Most critically we reduce our reliance on fossil fuels and less fuel burned means less harmful emissions released. It’s essentially a win win for truck owners, all road users’ and the environment” This is timely news in the New Zealand context. “Truck sales are experiencing considerable growth,” says Mr Jones, measures which we identify with are for example an increase in residential housing permits. As these grow, so too does demand for transport, not just through the building and contracting industry, but through furniture and consumer commodities, all of which travel by road in New Zealand. We looked to have turned the economic corner in that respect following the global fuel crisis. The potential for substantial cost savings, reduced emissions, greater safety and improved driver experience through monitoring and training.